FIDERE Avocats is a law firm specialised in labour law and civil service law. FIDERE Avocats works with employers, employer organisations and professional branches of all sizes and from all sectors to help them resolve labour-related issues by providing advisory and litigation services. FIDERE Avocats has a practical vision of the company thanks to its expertise in highly operational subjects. 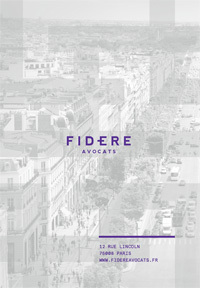 FIDERE Avocats is active in France and has an international presence as well.